We're all looking to meet someone, and in this day and age the easiest way to do that is through one of the various dating apps out there. But we can all admit it can get disheartening swiping through all of those people for the frustration of someone not answering your messages after matching. The fact is, we could be missing out on great people just because they don't have time in their busy lives to answer their dating apps every day. Not to mention the fact that we as a society are becoming so dependent on virtual conversations that we forget how to talk to each other in real life. Luckily, new app 'First' could be the fix us singles might need. On 'First', the stakes are high and your inhibitions should be low. 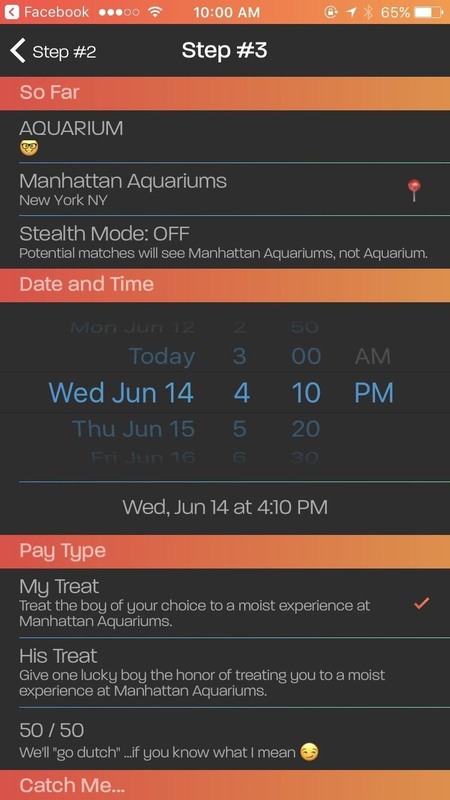 The app has you post a date and time for the ideal date you build. Once built, those who are nearby can pick if they'd like to join you. From there you pick the winner, no messaging allowed, and show up. It brings back the classic idea of a blind date, as you only know what the person's name is and what they look like before you go out with them. I downloaded the app, my curiosity piqued, and discovered that it's fairly simple. First, you create a profile using your Facebook account, like most dating apps, to help assure you that this person isn't fake (although we all know how easy it is to make fake Facebook accounts — so proceed with caution). After you're logged in, you are able to immediately start setting up the date. 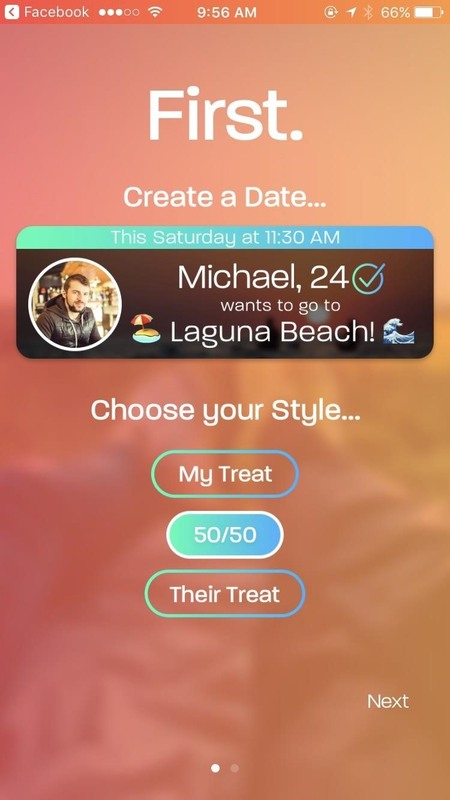 It asks you to 'Choose Your Style', letting you pick whether or not you want your partner to pay for you, or split the bill. 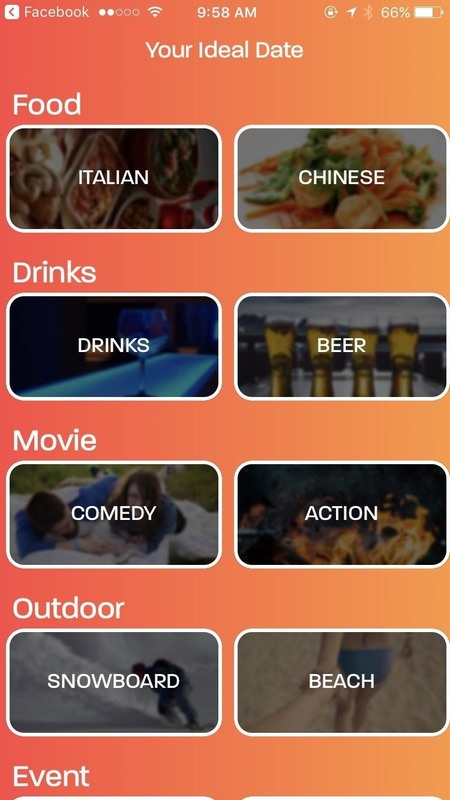 Then the app asks you what kind of date you want, giving you options like a movie, dinner, drinks, a concert, etc. 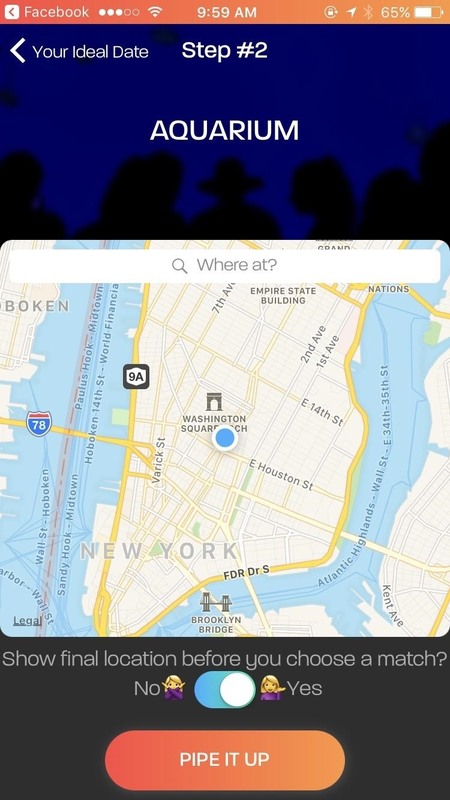 Once your option is selected, you confirm the location of the place you want to go and voila! Your date is out there for the public to match with. Then it's just a waiting game. Unfortunately, it seemed there was no one out there itching to go to the Manhattan Aquarium immediately like I was. In the meantime, I was able to take a look at what kind of dates people were offering nearby. The app is also LGBT+ friendly, allow users to pick their preferences in the settings page with the disclaimer "First welcomes everyone, more options coming soon". This implies that the app will soon become friendly for those who don't identify as male or female as well. 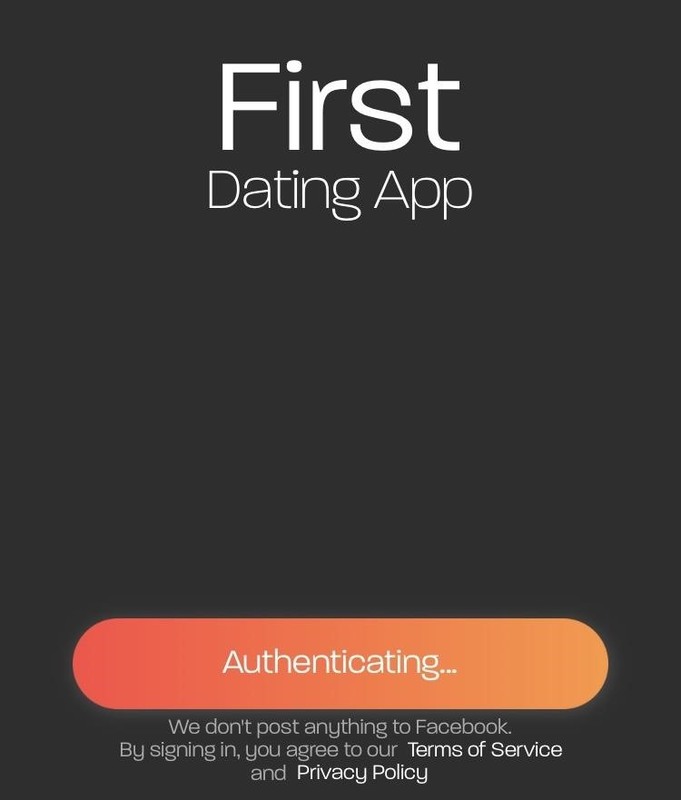 First is innovative in that it goes back to a more classic way of dating, calling itself the "first real dating app". 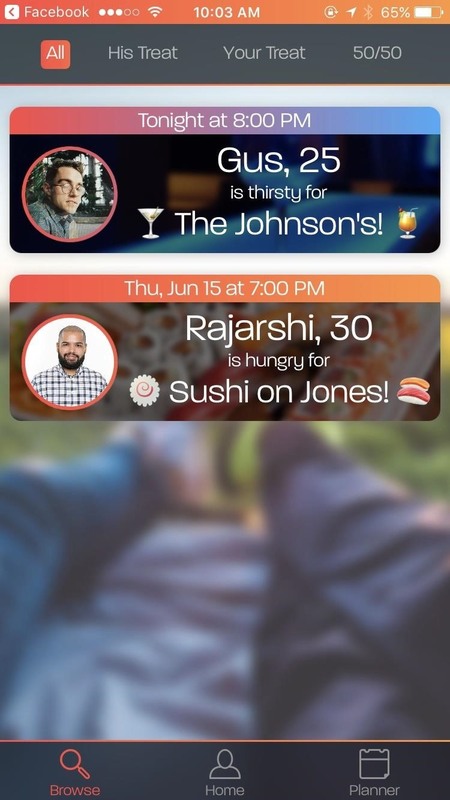 First's 25-year-old CEO, Truman Kain, said to Mashable that his goal for this app is "getting you off your phone and onto the date". In a world that is so caught up in social media, First certainly offers a welcome, scary, alternative to online dating. Putting yourself out there with people that you've never met or spoken to is risky but the lack of messaging options means you get to use those old conversational skills. It also means you're less likely to get Catfished. The app has a strict "No-Flake" policy so that if a user ghosts another user on a date or is not who they say they are, they are banned. After the date happens, users are also able to rate how well the date went, which isn't public information to anyone but those who work on First. This provides a way for First to weed out who is and isn't right for their app. A few successful dates in a row and you get "verified", which assures people that you are definitely who you say you are, and won't flake on the date. I believe First cuts through all of the BS and gets you to the point you want to be at, as simply as possible. I hate wasting time, and I'd rather find out about my dates in person instead of them explaining the best versions of themselves. If we don't click, I'd rather find out and have lost 30 minutes vs chatting for a week just to found out later that it's not going to work. And with more and more apps finding new ways to create a different dating online experience, it seems that people are agreeing that something needs to change. Bumble allows females to be the ones who decide who they want to talk to. High There exclusively allows stoners to meet other stoners. HotelTonight lets you book hotels last-minute for overnight hook ups on the down low. All of these apps have the same idea in that they are marketing towards the people who are looking for new ways to actually date. While it's unclear whether or not First holds the answers to solve your online dating issues, the app does have promise. It launches today nationwide. Be cautious, however, that if you are going to meet up with someone for the first time, it is in a public location to assure your safety.